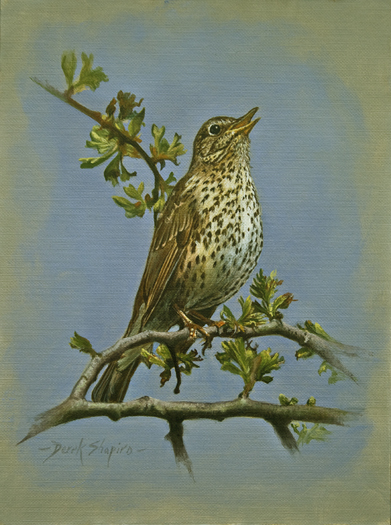 Most commonly encountered as a winter bird and the UK’s smallest true thrush. ” With heart-shaped face, buff back and wings and pure white underparts, the barn owl is a distinctive and much-loved countryside bird. 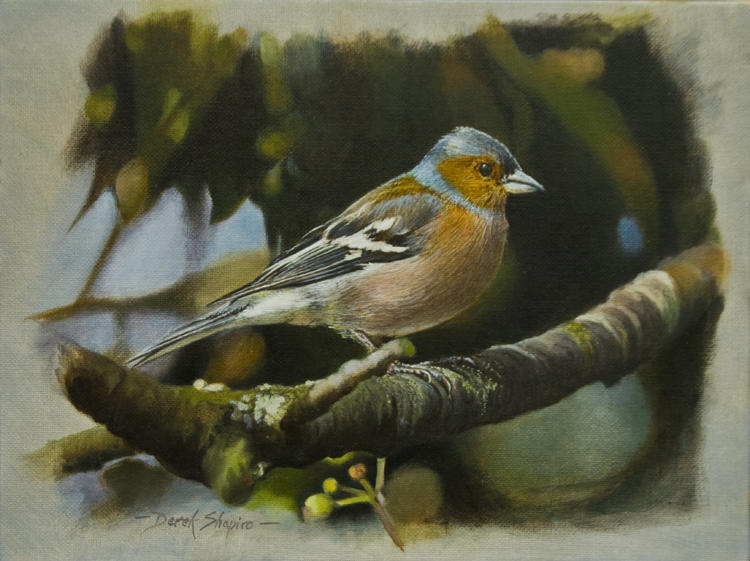 Widely distributed across the UK, and indeed the world, this bird has suffered declines through the 20th century and is thought to have been adversely affected by organochlorine pesticides such as DDT in the 1950s and ’60s. Nocturnal birds like the barn owl are poorly monitored by the Breeding Bird Survey and, subject to this caveat, numbers may have increased between 1995-2008”. 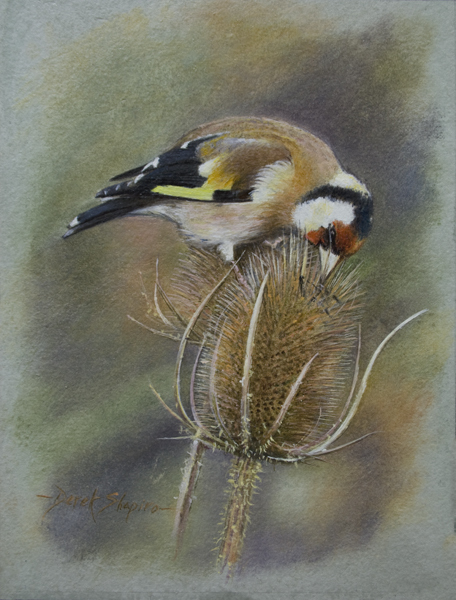 An oil painting of a Goldfinch feeding on Teasel. 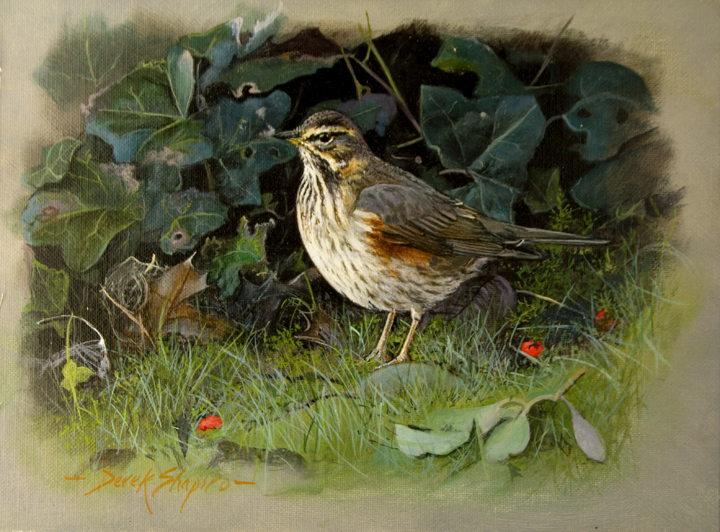 These striking birds are frequent visitors to my garden. They often feed on the nyger seed in the feeders sighted opposite my kitchen window and when I break for coffee, keep me entertained. These Whooper swans in full flight are on their way to their wintering sites in southern Europe and eastern Asia. 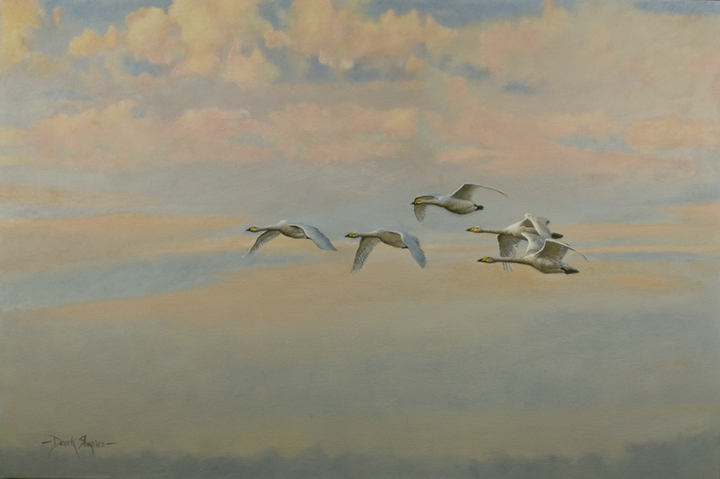 They can migrate hundreds or thousands of miles and have been seen flying at heights of eight thousand feet.” Perhaps the most impressive altitude record is that of a flock of Whooper Swans which was seen on radar arriving over Northern Ireland on migration and was visually identified by an airline pilot at 29,000 feet”!. 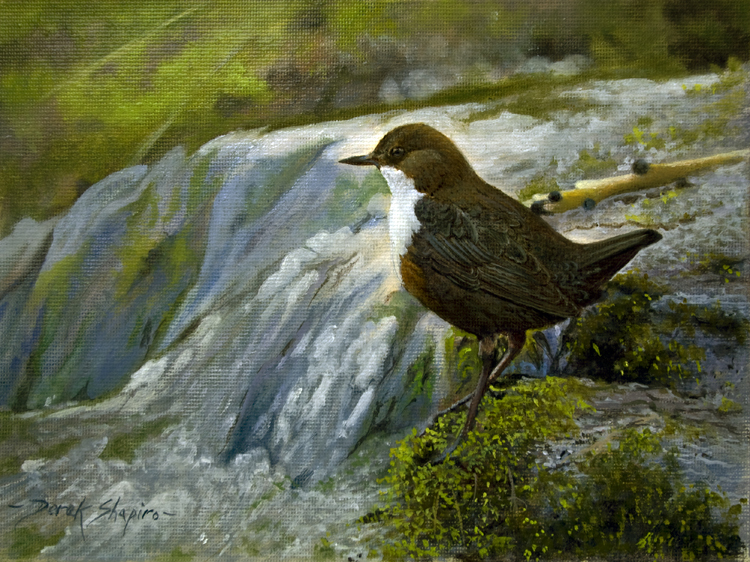 One of the challenges of this painting was to get across to the viewer the incredible heights they can fly during migration, hence the deliberate purpose of a large amount of sky. I often see skeins of Canadian geese flying over my house but they are never as impressive or as majestic as Whoopers. 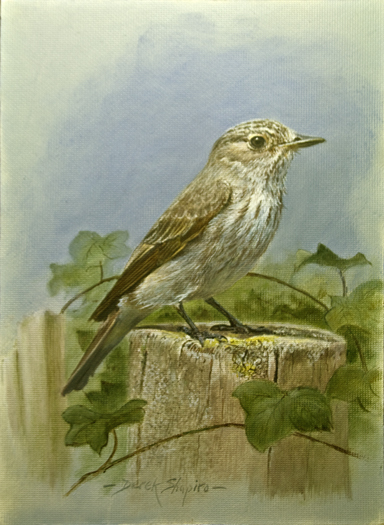 I used to see and here these lovely songsters in my garden frequently. Sadly they are now in serious decline, especially on farm land, and according to the R S P B it is now a Red List species and globally threatened.